A few weeks ago, I completed an LL.M. 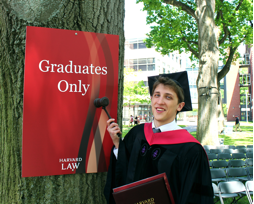 degree (Master of Laws) at Harvard Law School. The year has passed surprisingly quickly, yet it was memorable at each step of the way. With 65 countries represented in the LL.M. class (and many other programs and schools within close reach), engaging with bright legal minds from a wide variety of backgrounds has never been easier or more exciting. HLS offers over 400 thought-provoking courses, seminars, and reading groups, with more than half of those hosting fewer than 25 enrolled students. This framework catalyzed many fascinating classroom discussions and collaborations, allowing participants to fully experience the US methods of legal analysis and teaching. In addition, the facilities on campus, as provided by, e.g., the HLS Library, Graduate Program, or Dean of Students Office, were truly impressive; and the world-renowned professors nothing short of excellent. The courses I opted for related mostly to antitrust and intellectual property law or had a significant skills-oriented dimension, the latter in the form of collaborative seminars or courses on non-legal analytical methods. In addition, my year at HLS was filled with extracurricular activities. As the President of the Harvard European Law Association (HELA), I worked closely with faculty members, scholars, and associations at Harvard and beyond. Under the auspices of HELA, we organized a dozen lunch talks as well as the 2018 Harvard European Law Symposium, the latter exploring the topic of isolationism in the US and Europe by hosting a variety of speakers from both sides of the Atlantic, such as international academics, supreme court judges, policymakers, lobbyists, attorneys, and enforcement officers (among which various previous Fulbright scholars). Furthermore, as a Submissions Editor at the Harvard Business Law Review and a Submissions Committee Member at the Harvard Journal of Law & Technology, I helped assessing the academic quality and fitness for publication of contributions submitted to both law journals. The above mentioned endeavors comprised an excellent opportunity to get to know and collaborate with many talented people, not only from the pool of LL.M. candidates but also from the J.D. program, different schools at Harvard, and universities in Boston and New York. Being able to befriend such a terrific ensemble of Americans and internationals, whether it be in the context of HLS (extra)curricular activities, various travels across the US, the Fulbright Gateway Orientation, or the Boston nightlife, was an incredible privilege for which I will always remain grateful. Since graduation, I have been working as a Visiting Researcher at HLS to further develop a paper into publishable scholarship. Upon my return to Belgium, I will resume activities as a Ph.D. Fellow of the Research Foundation Flanders and Teaching Assistant at the KU Leuven, Faculty of Law. Looking back, the experience at Harvard has been life-changing on diverse personal, academic, and professional levels. In that context, it would be difficult to overestimate the tremendous support provided by the Frank Boas Scholarship for Graduate Studies in realizing this objective. In a time where international mutual understanding and cooperation are highly relevant and important, the Frank Boas Scholarship enables students from a broad spectrum of disciplines to engage in an enriching experience at Harvard and to interact with a community of talented scholars from across the globe. I am truly grateful to form part of the Boas family and will work to also help future students obtain the opportunities essential to fulfilling their aspirations, opportunities which have been provided to me so generously by the Frank Boas program.